PINES brought Blake Crouch’s writing to a new level in my view. The story combines several elements that I enjoy in a story. Fast-paced, horrifying, and suspenseful, Crouch’s story featuring a relentless protagonist thrust into a seemingly hopeless situation against over-whelming odds. 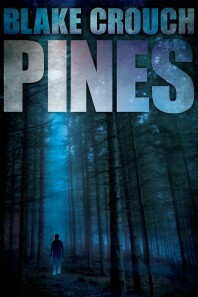 I had a hard time classifying this book, since PINES blends several genres seamlessly, spending much of its time planted firmly in suspense horror. Still, mystery and thriller elements abound, along with a genre I will not mention, in fear of spoiling the book’s unprecedented reveal. You don’t want to miss this one. PINES introduces the reader to Ethan Burke, a Secret Service agent who regains consciousness on a riverbank just beyond the outskirts of the idyllic town, Wayward Pines, Idaho. With little memory of why he is in the town, he starts to explore his surroundings, slowly adding pieces of this puzzle to a scrambled mosaic of fragmented explanations and inexplicable coincidences. Mystery turns to menace, as he slowly starts to accept the fact that he can’t leave Wayward Pines. All paths out of the town lead him back to where he started, and he starts to question the very perception of his own existence. As he starts to more forcefully seek answers, the thin veneer of Wayward Pines starts to lift…and this is where the story started to far exceed my expectations. Mystery and suspense yields to the sheer horror that kept me returning to the pages as frequently as my schedule allowed. Although the incredible twist is foreshadowed at points later in the story, I kept guessing wrongly until Burke “escapes.” From that point forward, I couldn’t put it down until the book was finished. Blake admits to paying homage TWIN PEAKS with this novel. He does more than that. He briefly captures the essence of the disturbingly surreal series, in an often gritty and often brutally frightening story reminiscent of the TWILIGHT ZONE. To me, this is by far Blake Crouch’s best book…which is a tough act to follow after RUN. Well deserved. My only complaint is that you ONLY gave us two books for the summer. I’m looking forward to the sequel to PINES. I should have mentioned this in the reviews, but the family bond them at the core of your writing is one of the most enjoyable aspects common to your last three novels. RUN, EERIE and PINES. Three distinctly different books tied together with this bond. This is the first time I read a book by Blake Crouch. I loved it I could not put it down and I am looking forward to reading RUN, AND EERIE. Thank for the fun read. Pines is thrillingly surreal, like a futuristic X-Files scenario mixed with survivalist science fiction toward the end. It does throw up some interesting clues about the nature of society and the adaptability of the human race (when we reach a time of whatever’s left of it).